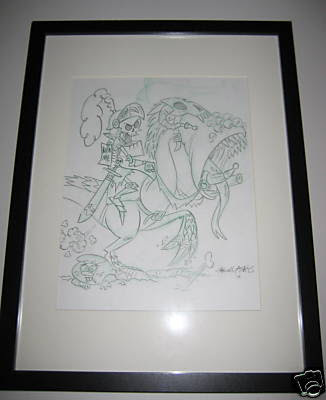 ORIGINAL CARTOON NETWORK ART ON EBAY! 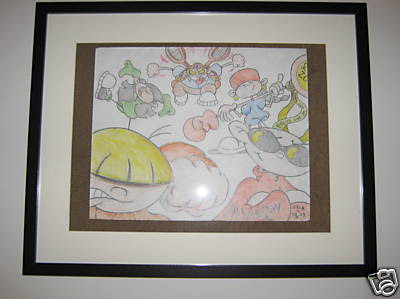 You know I love drawing the KND! And I love drawing them even more if it's to benefit a good cause. So when I was asked to do a drawing for Team In Training, a division of the Leukemia and Lymphoma Society, you KNOW I was all over that. And I wasn't the only one. 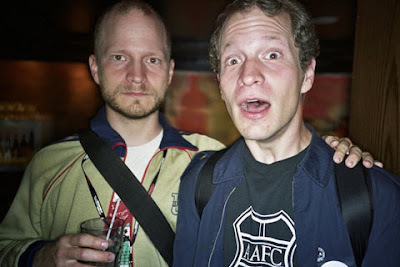 Sooper Cartoon Network Creator pals Maxwell Atoms (of the Grim Adventures of Billy and Mandy Atomseses) and Carl H. Greenblatt (of the Chowder Greenblattseses) dove in headfirst as well. Wanna see some of the yumminess? And there's even more! Just go on over to HERE to check out all the awesome stuff available! And it's all TAX DEDUCTIBALICIOUS! What's that? You say you don't LIKE any of the artwork? Or your apartment doesn't have anymore room for artsy fartsy stuff? Well, that's okay because you can donate without having to bid right over HERE! And really... What DOESN'T bacon cure? Bonus Fun Fact: That's me channeling a $1.98 version of Emeril! Blech! Looks like May is gonna be a sooper busy time! 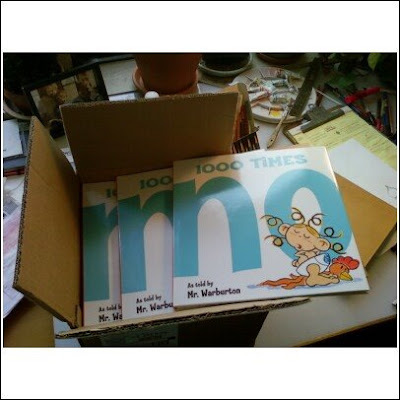 I've got 1000 Times No readings and signings piling up at bookstores and schools in New York, New Jersey and Pennsylvania! But the FIRST store I'm going to visit is right in my neighborhood here in Bed-Stuy Brooklyn! 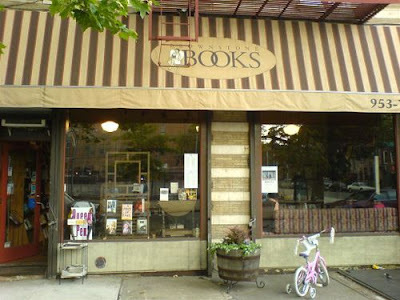 It's Brownstone Books, a great independent book store that's celebrating it's 10th anniversary this year! Ya gotta love the small guys making it happen. So at NOON on Saturday May 2nd, if you're anywhere near Brooklyn, bring the kids, or just yourself and support Brownstone Books (and me!). All the info you need to get there is on their site HERE! When I first got a real live copy of my book I ran around Curious Pictures showing ANYBODY and EVERYBODY! And hours later when I got waaaaaay across the studio to Mary Knox, Supreme Commander of Commercials, she gave it a cursory glance before handing it back to me and grunting something like, "Great- now go animate it." At first, I was like, "WHAT?! Who's got time to do THAT?!" the more I saw the wisdom in the Mighty Knox's words. I could make a really cool animated promo for 1000 Times No and send it out to all the bookstores, kid-lit blogs, schools, etc, etc. I give to you the teaser for 1000 Times No! And I can't forget to give a huge shout out to all those involved. You guys are my rock and I can't thank you enough! you can order one (or five). Mr. Willems has frequently expounded on the thrill of receiving a big box of bodacious, brand new books and while I kinda knew what he was talking about- to actually experience it is something totally different. Some might say I got a little misty upon seeing my contractually obligated 25 copies. Others might think I had just finished chopping some onions. But everyone should know- it's quite a moment. Especially when it's your first book. There are many ways to say "no," and when Mom says it's time to leave, Baby Noah uses them all. The word itself is not effective, so he moves on to slang, robot-speak and pig Latin, and that's just the beginning. Simplified text, retro design and minimal line work reminiscent of Mo Willems's show Noah expressing himself adamantly in a multitude of ways. The exaggeration and laugh-out-loud humor escalates as various gestures (headshake, back turn) are attempted, and a multitude of languages (Hindi, Etruscan and Russian, to name just a few, with matching costume changes) are utilized. Other modes of communication (Morse code, text messaging, sky writing) come into play, but all fail. Then Mom points out that they are leaving to go to the playground, and Noah may have to reconsider. This clever, appealing concept is sure to be a hit with the very young; with gentle humor and a cartoon-like atmosphere, the expressive pictures beautifully capture the point of view and opinionated stance of a two-year-old who believes he knows exactly what he wants. And when they say 'reminiscent of Mo Willems' do ya think they mean 'another animation bum invading children's literature'? Regardless, thank you Kirkus Reviews! I LOVE THE SLJ AGAIN AND AGAIN! ALL I do is talk about the SLJ. It's SLJ THIS and SLJ THAT. But how can I NOT talk about them when they gave 1000 TIMES NO such an awesome review?! Pre-K Noah, with his unruly blond curls and oversize diaper, is a stubborn little fellow with a fondness for every toddler's favorite mantra: "no!" When his mother sweetly says, "It's time to leave," she is met with page after page of negation, from cowboy speak to pig Latin, Mandarin Chinese to Morse code. Gouache cartoon scenes visually reinforce Noah's multilingual vetoes, from a full-page sphinx and hieroglyphics to a small square panel with a text message. Endpapers provide identification of the languages, pronunciations, and cultures that the precocious youngster employs. Delightful fun in its theme and delivery, this story will be asked for again and again." The SLJ is the School Library Journal- THE world's largest reviewer of books, multimedia, and technology for children and teens. You can check out their site HERE but to get to the juicy stuff you gotta have a subscription and stuff. And obviously they have AWESOME taste in books. BONUS: If you're into picture books... then you should be checking out Fuse #8's blog that's attached to the SLJ. Currently she's listing the top 100 picture books as picked by her readers! Most of you have probably seen this since it appeared on Cartoon Brew yesterday, but for those who don't frequent Jerry and Amid's sooper source for animation news, I'm sending you on over. 2. The boys eventually moved down to NYC and became an integral part of the ASIFA-EAST scene, amazing folks with their sooper fun independent films. Like this here Moonraker thingie. 3. 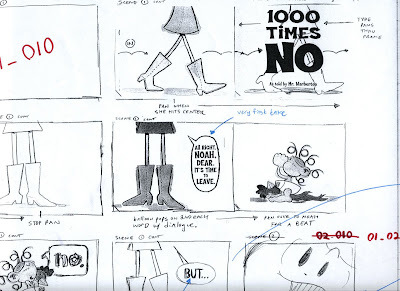 Cartoon Network still wanted to work with the brothers and slogged through years and years of development, eventually churning out another pilot called The Upstate Four. Oddly, the network wasn't convinced by the pilot (even after it won Best Children's Film at Ottawa!) so they decided to make ANOTHER pilot. But this time, I was brought in to serve as advisor/translator/shepherd/dinner date for both sides. Which basically means, I would meet up with Fran and Will, usually over a yummy dinner paid for by CN, and listen to their ideas, help brainstorm, give advice on navigating the choppy executive waters, and order another round of drinks. Will always made sure to have pie. Unfortunately, with major shifts in Cartoon Network came major shifts in what they were looking for, and the Upstate Four was jettisoned before the 2nd pilot could be made. A shame, too. It was a funny story about a completely Clapper-automated house going ballistic when a clap-happy game show comes on the TV. Who knows... maybe it was ME who ruined everything? Regardless... you can read the interview and see the Upstate Four pilot HERE! Also don't be shy to check out Fran's and Will's websites! Yeeeaaaaaaaaaaaaah... it's not that I WANTED to revisit any of the comics I did in high school. 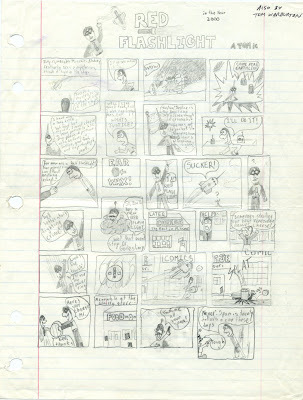 But a couple weeks ago I needed some reference material for bad high school comics. And I thought, "Why not go right to the MASTER of bad high school comics?" • Please note the clever addition of 'in the year 2000' to the title. This added exactly .21% more humor to the ENTIRE comic. • It's aTOMic... because my name is Tom... and it's a a comic... and... aw, jeez. • Cheese AND Spam in the same comic?! Madness! Yeah... I'm gonna go bury these comics in the backyard. And WHO is that motley assortment of characters arranged like tasty chocolates in a box? What? You didn't recognize the disembodied topiary giraffe head from the episode 'Megablades of Grass'? But I DO remember that this t-shirt was given out as a holiday gift to the crew from awfully awesome Pepper Ann creator Sue Rose and hilarious head writer Nahnatchka Kahn back in 1997. They figured that the OBVIOUS thing to do was make a shirt with Pepper Ann, Nicky and/or Milo on it... so why not do the opposite and give the show's 'extras' some love? 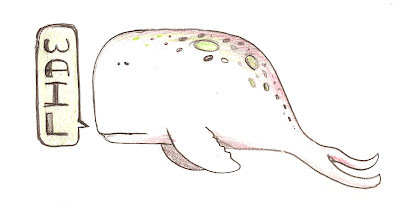 The REALLY cool thing is that they're all my drawings... except for a couple, like Ms. Bladdar. That one is totally Sue's. And there are a couple she did a rough for and I just added a thing or two. And I don't think I did Shelf McLain, either. But the rest are TOTALLY mine- I swear! I was SOOOOOOO proud when I first saw this shirt! But dang if I can remember who they all are.